Disclosure: Some of the links below are affiliate links. Meaning, at no additional cost to you, I will make a commision if you click through and make a purchase. Are you waking up with a stuffy nose, feeling a little congested? Perhaps some post-nasal drip has your throat scratchy? The allergens in your sheets could be the problem. Lessen the allergens in your bed and your immune system can focus on fighting the more sinister germs like cold and flu viruses. The average American changes their sheets every 24 days–men wait even longer, according to a survey by Mattress Advisor. That’s pretty gross considering all the germs, sweat, sexual activity (yes, I said it! ), dirt and everything else in your sheets. Your body comes into contact with your sheets for several hours a day. Besides that, your sweat and dead skin cells embedded in your sheets only serve as fodder for the germs and dust mites lurking in them right now. Wouldn’t it make sense to change your sheets at least once per week? Since your bed is one of the largest horizontal surfaces in your home it’s easy for dust, pollen, pet dander, and anything else floating around to eventually settle on your bed–including germs hitching a ride on those tiny particles. If you are not washing and changing your sheets frequently, you will be more susceptible to allergies, illness and longer bouts with illness which occur more frequently. Wash your sheets and covers in the hottest water possible. DO NOT USE BLEACH. Bleach can discolor and weaken the fabric, plus bleach does a great job in contributing to the growth of super germs. Use a plant-based detergent instead. Plant-based detergents can kill up to 90% of germs any way–especially when mixed with extra-hot water. Dry the sheets and covers thoroughly. Leave no moisture behind or else mold can start growing along with a foul odor. If your covers won’t fit in the dryer, try draping them over a chair and place them in a warm spot in your home or in the outside sun. VACUUM THE MATTRESS. This step can’t be stressed enough. Your sheets are porous–meaning they allow germs, mites, sweat and dirt to seep into your mattress. One way to get them out is with a vacuum upholstery attachment found here. If you skip this step, those same germs and mites will be right back in your sheets as soon as you put the sheets back on the bed. STEAM THE MATTRESS. If you have a steamer that gets over 200 degrees fahrenheit, great! Use it to kill those germs and mites in your mattress. If not, we offer a mattress steaming service that covers all these steps. Place sheets and covers back on the mattress. There you have it. Seams simple. Most people think to do it, but can only get around to it every 24 days. 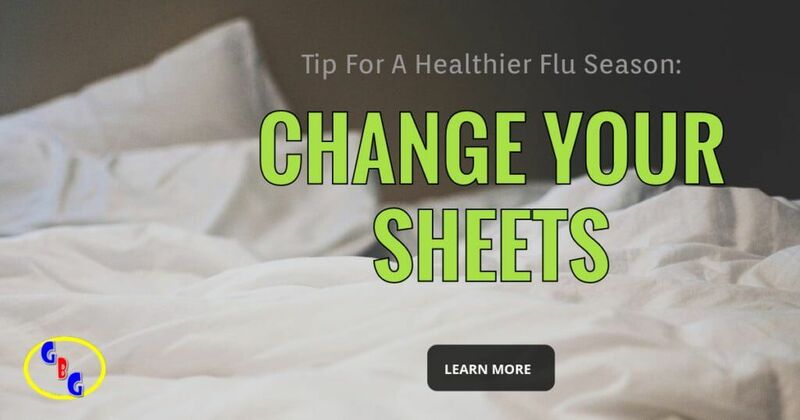 Change your sheets frequently and you may end up having a healthier flu season.